It's a bird. It's a plane. Wait, it's a meteorite hitting the moon? 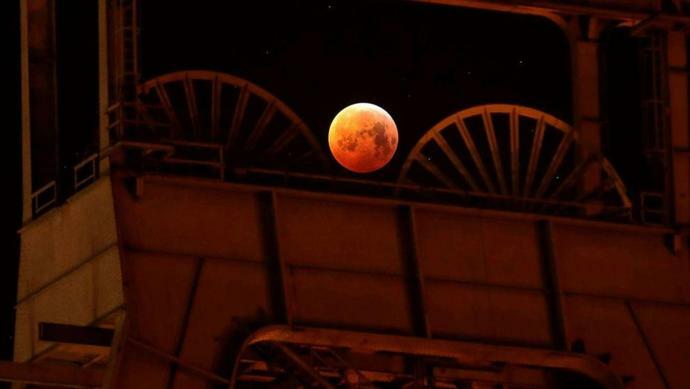 On Sunday, millions of people around the world watched as the Earth's shadow covered the moon in a copper-reddish glow in what was known as a "Super Blood Wolf Moon." It was the first full moon of the year (a wolf moon) and it came at a time when the moon was also closest to Earth (a super moon) and going through a lunar eclipse (a blood moon). While observing the eclipse, however, some observers noticed a small flash on the moon. Many astronomers speculated what had happened, but one of them, Jose Maria Madiedo from the University of Huelva in Spain, quickly confirmed that it was indeed a meteorite that hit the moon. "A rock hits the moon during the total eclipse," Madiedo tweeted on the morning of Jan. 22. Attached to his tweet was a YouTube link displaying the impact on the top-left half of the moon. Madiedo observed the meteorite flash through Spain's Moons Impacts Detection and Analysis System, also known as MIDAS, which is run by the University of Huelva and the Institution of Astrophysics of Andalucia. The MIDAS project uses data from several astronomical observatories throughout the country to track flashes on the moon's surface and gather information about the rate of lunar impacts, which in turn can tell astronomers about the frequency of impacts in the Earth's atmosphere. "We employ an array of telescopes endowed with high-sensitivity cameras that monitor the lunar surface in order to detect these events," Madiedo told ABC News. Meteorite impacts happen all the time, Madiedo said, but they aren't easy to record for MIDAS, which requires the moon to be dark so that the white flash is visible - usually during the 10 days around a new moon. He said that this lunar impact was significant because it was the first time astrophysicists in this field of research were able to record a lunar impact during a lunar eclipse. The next lunar eclipse will only be a partial lunar eclipse, visible from South America, Europe, Africa, Asia and Australia. It will occur on July 16, 2019. As for another meteorite strike, those can occur at any time, but they'll most likely require astronomers to release videos and pictures. Don&apos;t expect to see any pink coloring.